NIGHT RANGER don´t really need an introduction, but here goes. Formed back in 1982, after some years as a trio under a different moniker, consisting of Jack Blades (ex. RUBICON), bass/vocals, guitarists Brad Gillis (ex. RUBICON) and Jeff Watson, drummer Kelly Keagy (ex. RUBICON) and keyboard player Alan Fitzgerald (ex. MONTROSE, ex. GAMMA). Their early eighties albums are all legends, and they made a name for themselves with songs like “(You Can Still) Rock in America” and the perennial power ballad “Sister Christian”. In the latter part of the eighties the band encountered harsher times, with members coming and going in vane attempts at a return. Things seem only to have started stabilizing in the late nineties and not until now they feel like a proposition to count on. The latest incarnation of the band feature original members Jack Blades, Brad Gillis and Kelly Keagy, plus later additions Joel Hoekstra (TRANS SIBERIAN ORCHESTRA, ex. JOE LYNN TURNER)and Eric Levy. 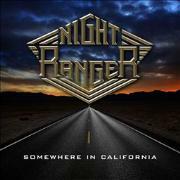 NIGHT RANGER 2011 opens with the ultra catchy “Growin´ Up in California”. A fine opener with loads of charm as well as a nice arrangement and a sweet refrain. They actually surprise me with the heavy yet melodic “Lay It on Me”, but don´t worry, there is room for a “whooa whooa”. The charm offensive continues in “Bye Bye Baby (Not Tonight)”. There is the NIGHT RANGER factor all over, not to be mistaken. The oddities, or modern influences are represented by “Follow Your Heart”, nice but with the wrong arrangements, and the over matured “Live for Today”. Otherwise this is the album NIGHT RANGER SHOULD have made many years ago, to restore the public faith in them. There is a lot of US rock attitude, , a beautiful ballad, and the typical storytelling of the band. Overly mature in some few moments perhaps, but this is after all around three decades after their first album. I´d say that NIGHT RANGER has well proven that you can still rock in America!